first, thank you for your very fast answer. So far, i didn't even think about using the high level generic assembly language for this (and it's a shame given how easy it is to use in this configuration). I followed your suggestion and tried your _expression_ (which seems perfectly correct to me) and the deformation was, as far as i could tell, identical to the one in the Results_nosym.png. 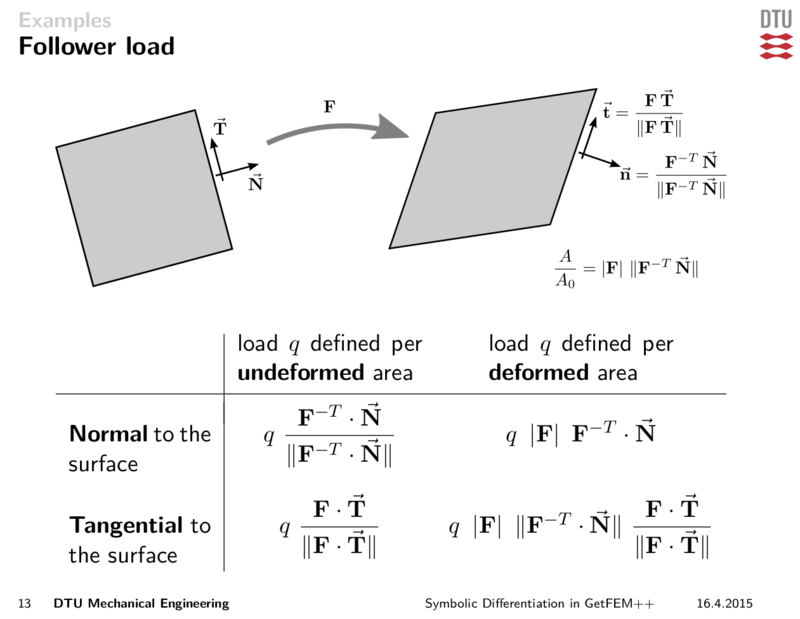 "Please note that in all problems the direction of the pressure boundary condition changes with the deformed surface orientation, and its magnitude scales with the deformed area." Therefore, thanks a lot for providing your notes here, it is very helpful...And it seems to actually work just fine! There is no visible difference between the deformed configuration given by Getfem and the reference solution with this modification. So if your p is the actual blood pressure you need the upper right case of the table with q=-p. If at some point you also need shear stresses from the fluid you can also use the second row of the table.